The reason Windows tablets have sucked is that they've crammed desktop interfaces onto tablets. Assumedly, the Apple tablet's magic is in the interface. So it's funny that Apple's secret tablet from over 14 years ago made the same mistake. The Newton was still in production. But what Apple secretly pitched to select medical centers over a decade ago wasn't a Newton. 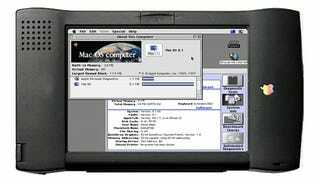 It was a 10-inch-or-so tablet, running an interface that was much, much closer to the full desktop Mac OS—Mac OS 8 at the time—modified with pen input. Though pitched to the medical market, it was a general-purpose computer that was in the advanced prototype stages. It never shipped. (Much like another ancient Apple tablet.) That's the story, according to one of the few medical personnel who saw the monstrosity. Imagine something like this, but not quite as swishy. After this Mac OS tablet was apparently killed in the night, we wouldn't hear about another tablet until after Jobs returned, talk of Inkwell in 2000—the pen input software ultimately built into OS X—with the word of a "tablet" first emerging in 2003. Apple's still interested in medical IT applications, actually, one place tablet PCs have actually managed to gain traction. Last year, it quietly partnered with Epic Systems, one of the major electronic medical records companies, to test software on the iPhone for accessing patient medical charts. Perhaps less than coincidentally, Apple execs have supposedly been spotted making visits with some frequency to Cedar-Sinai Medical Center in LA, to talk about a new device, and how the hospital might use it. An Apple tablet would make for one very fancy clipboard.